Our Santa Barbara elopement and wedding packages were designed to take the worry out of planning, giving you more time to enjoy the moment. Select the elopement package that suits your needs and we do the rest. To enhance the beauty of your backdrop, you may add one of our optional wedding arbors to the elopement package of your choice. We offer same day impromptu elopements for $150, based on availability. This is a ceremony only package. I will officiate your ceremony in a warm and thoughtful way tailored to your vision with personalized vows, your love story, etc. You may have up to 25 guests witness your big day. This is a signing of the marriage license and wedding photos only package. If you want to be legally married without a ceremony but would love the photo memories of your mini elopement, this is the perfect package for you. AlmaRose will ask you the mandatory questions, sign your marriage license and photograph the husband and wife loving moments afterward. Includes a witness. AlmaRose will officiate your ceremony and photograph you afterwards capturing the husband and wife loving moments. Includes a rose bridal bouquet and boutonniere. This package includes both an officiant and photographer. If you want both your ceremony and husband and wife loving moments photographed afterwards, this is the perfect package for you. This packages includes the officiant, photographer and a vintage turquoise 1955 Thunderbird getaway car with a 'Just Married' sign. You will be chauffeured throughout the main streets of Santa Barbara announcing your 'Just Married' status. Guaranteed fun! This elopement package includes the elements of a large wedding...an officiant, photographer, bridal bouquet/boutonniere, processional music and your first dance. Add an arbor to make even more perfect! This package includes everything but the wedding dress! This is the most romantic wedding beach wedding experience in Santa Barbara during the golden hour at sunset. Everything takes place under a four-post canopy and large crystal chandelier...the ceremony, first dance, champagne and cheese/fruit plate, or a wedding cake for two. It's your own little paradise. You have a choice of a table and chairs or a picnic-style experience where you sit on large pillows and your tabletop is wooden pallet draped and decorated with flora, greens and a candelabra. Just imagine exchanging romantic glances while you sip on champagne and enjoy the sunset. Oh so romantique! You only do this once you might as well splurge! Signing of the marriage license to make your marriage legal. AlmaRose will ask the mandatory legal questions and sign your license. Includes a witness. You may design your own elopement wedding package by using our a la carte menu. Do not hesitate to ask AlmaRose for assistance in planning your elopement wedding. 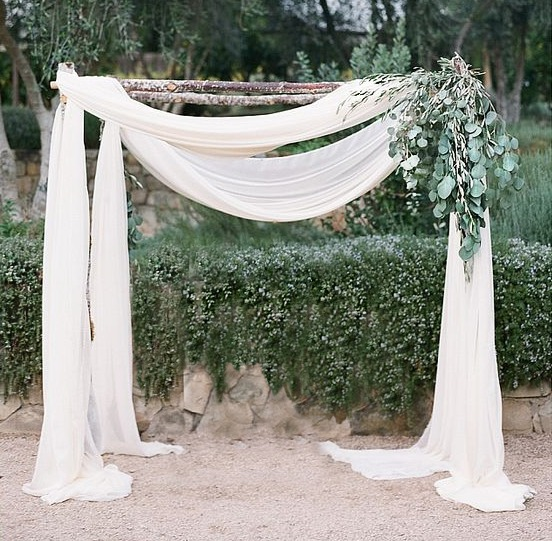 To enhance the beauty of your backdrop, you may add one of these stunning wedding arbors to compliment any the our elopement packages. AlmaRose will be happy to customize an elopement package for you. We accept confidential marriage licenses issued only by the County of Santa Barbara. No outside county confidential marriage licenses accepted, no exceptions. For additional set up options, please refer to our sister company, Romantic Santa Barbara Weddings. Travel fee may apply for outside Santa Barbara elopements. Your photos will be displayed on Pixieset.com for digital download and sharing for 7 days. All photos may be subject to copyright. To apply for a Santa Barbara marriage license on-line, please click on the above link. The cost of a regular public license is $100 and a confidential license is $111. Marriage licenses are valid for 90 days only. No outside county confidential marriage licenses will be accepted unless issued by Santa Barbara county clerk's office. No exceptions! Our Santa Barbara county clerk's office is small and convenient. It usually takes less than half hour for the process of obtaining your marriage license.Santa Barbara County Clerk information: 1100 Anacapa Street,Santa Barbara, CA 93101, (805)568-2250.